TO UNDERSTAND OUR COMPLEX FINISH, IT HELPS TO KNOW WHERE IT ALL STARTS. We start by hand-selecting the finest 100% Weber Blue Agave and crushing it with a two-ton volcanic stone wheel called a tahona— an ancient, labor-intensive method. The agave juice is then fermented and distilled with the fiber, resulting in a complex, earthy taste. The perfect way to enjoy Patrón is responsibly. 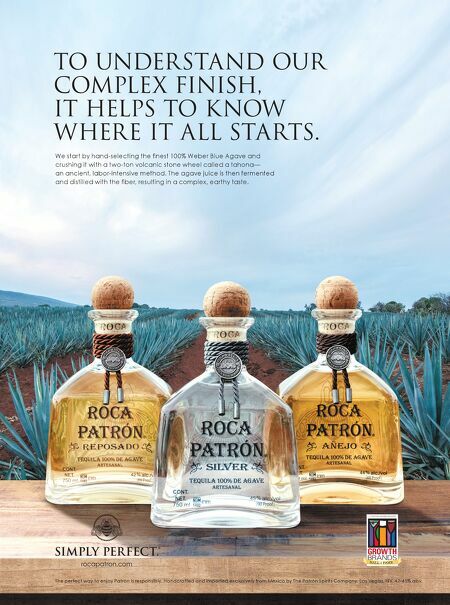 Handcrafted and imported exclusively from Mexico by The Patrón Spirits Company, Las Vegas, NV. 42-45% abv.